Another Week, More Shadowrun: Crossfire Action! 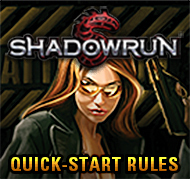 Last Tuesday we announced the Street Date for Shadowrun: Crossfire and allowed for online pre-ordering, while the week before that we ran a great Crossfire Virtual Run that unlocked the Demo Kit rules & cards. This week? Time for a new Mission to use alongside your Demo Kit. 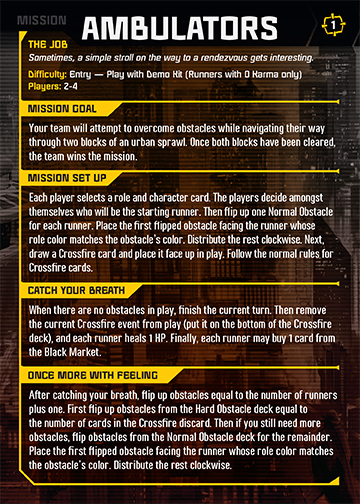 Below are the front and back of the Mission; you can also scroll to the bottom of the Downloads page and click on the last link (SHADOWRUN: CROSSFIRE DEMO KIT MISSION: Ambulators) to download the free PDF. 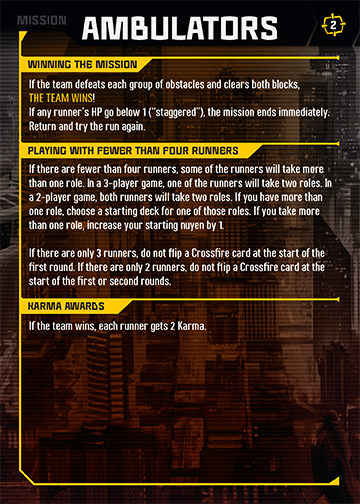 If you’ve not yet taken a look at the Shadowrun: Crossfire Demo Kit rules and print & play cards, you can find them at the bottom of that page as well. 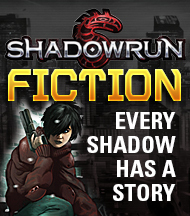 Our good friends at The Dice Tower have posted a video review of Shadowrun: Crossfire. Additionally, they provide a thorough review of how to play the game, show off the contents, and more. 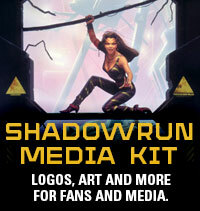 Haven’t heard of Shadowrun: Crossfire yet? The back of the box provides a thorough run down of the flavor of the game and its contents. Don’t forget to check out The Dice Towers’ review! The game is on a ship now heading towards our warehouse…look for an announcement of when the game will be on store shelves in the very near future. 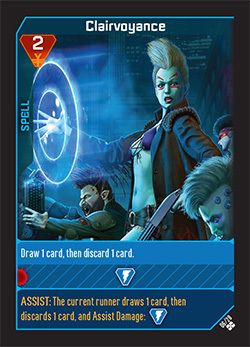 Thought we’d share a slew of pre-final Character Cards for Shadowrun: Crossfire. 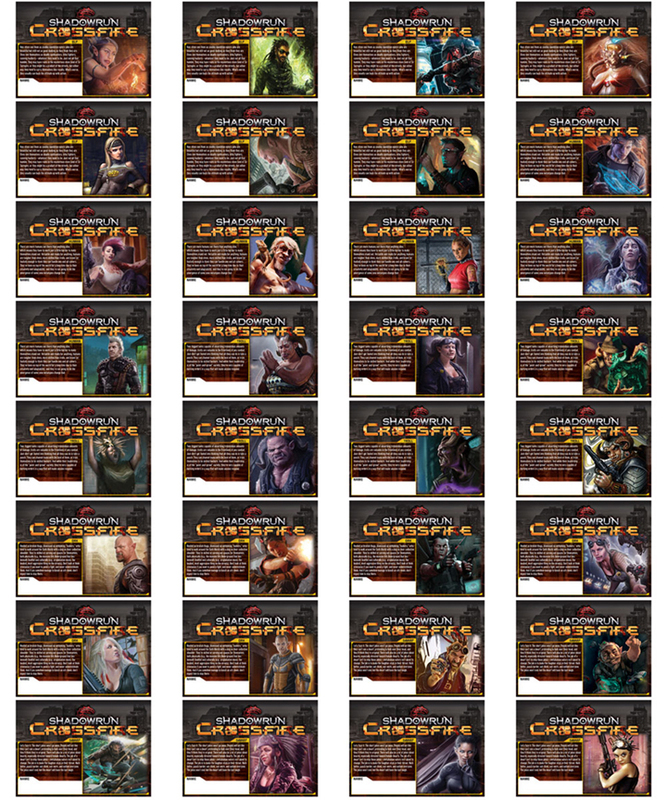 Not all of these will appear in the base Crossfire set; some will go into the base set, others will be included in a Character Card Expansion Pack 1. 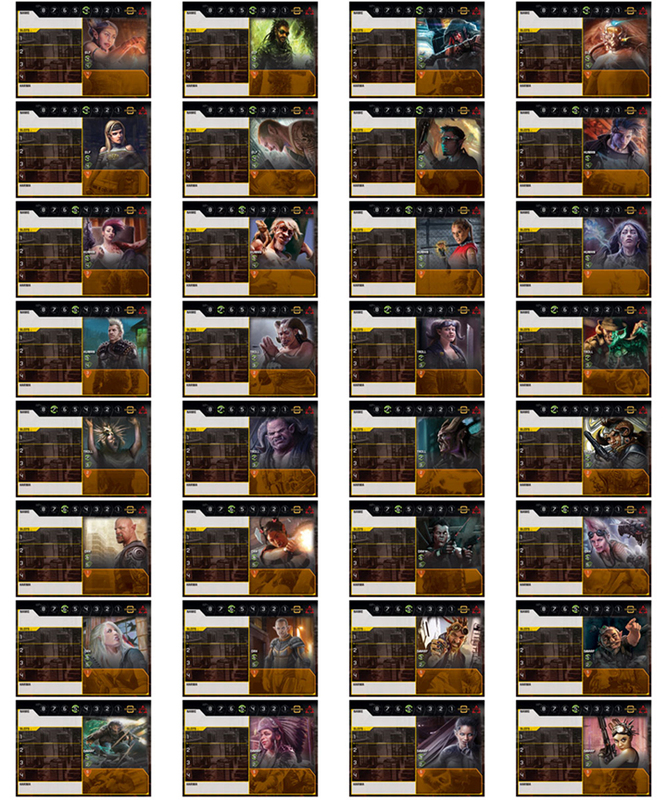 If you’d like a close-up look at one of the Character Cards, check out our Tumblr. Don’t blink . . . I must not blink! I’ve heard that as long as you are looking at a Mage, they can’t do anything to you. And one just walked into the room with me. Sure, it’s probably all just superstition, but then I’ve seen what a Mage can do. How can they have so much power? Where does that power come from? I just don’t get it. 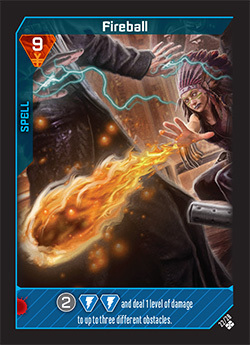 In Shadowrun: Crossfire, the Mage is the master of deck manipulation and dealing damage. 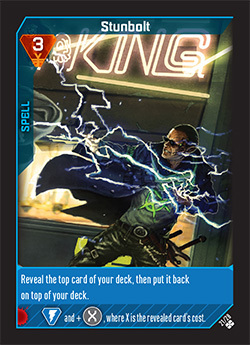 The Face is all about people skills, the Street Samurai is about smashing things in a fight, and the Decker is about hacking (which is what I do), so let’s tap the net for specs on the Mage. The Mage’s role color is Blue, which are spells that manipulate your deck, allow you to draw cards, and do a ton of damage. Two of these mechanics are combined in one card: Deathtouch. First, Deathtouch lets you look at the top 3 cards of your deck and then put them back in any order. And second, it does an additional point of colorless damage for each spell card revealed this way. With its base damage of two Blue to begin with, you can crank out 5 damage with this spell! And if you want to know why rearranging your deck can be so helpful, take a look at Stunbolt. You reveal the top card of your deck and do one Blue damage plus colorless damage equal to that revealed card’s cost. Then you put the revealed card back on top of your deck. So you use Deathtouch first and stack the top of your deck with your biggest card, then reveal that card for maximum damage when you cast Stunbolt. 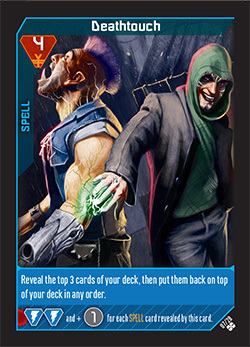 Next are a pair of cards that allow you to draw more cards to help you get through your deck faster. The first is Clairvoyance, which allows you to draw one card and then discard a card along with doing one Blue damage. Clairvoyance also has an assist ability, which can be played only during another runner’s turn. The assist is exactly the same as the main ability, except that it will affect the runner you play it on instead of yourself. The second card of the pair is Guiding Spirit. This card allows you to discard your entire hand and then draw that many cards. It also does one Blue damage and one colorless damage. Remember that if you run out of cards in your deck to draw, draw as many as you can, reshuffle your discard into a new deck, and then finish drawing the cards you need. 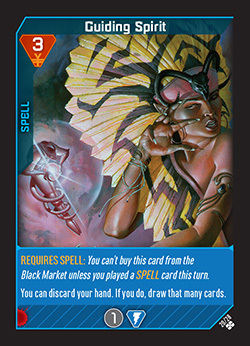 Don’t forget, however, that you have to play a Spell card in order to buy Guiding Spirit from the Black Market, making it much harder for anyone other than the Mage to purchase it. Next are the pure damage spells starting with the powerful Lightning Bolt. This Spell card clears two entire levels of an obstacle’s damage track. It doesn’t care what the color of those levels are or how many colorless damage is needed; it just clears them. 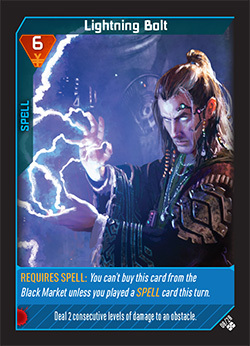 This spell also has a purchase restriction of requiring you to play a Spell card in order to purchase it from the Black Market, meaning that you’d better focus on magic if you want to use a Lightning Bolt. And finally there’s the Fireball. It does two colorless damage plus two Blue damage. It also does splash damage of one level to up to three different obstacles, which can really be helpful when the team has already beat down the obstacles facing them. It doesn’t matter who those obstacles are facing, so spread the damage around. Well, I now understand a bit more about Mages, but they still make me nervous. Maybe after this run they won’t creep me out so much. Who knows?